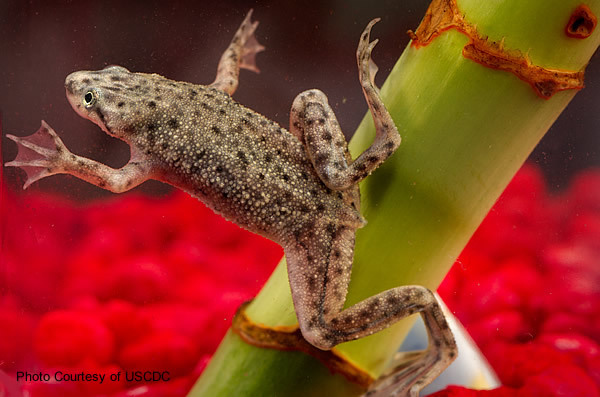 African dwarf frogs and their keepers are each at risk from the other, especially when the keepers don't know or don't follow some simple, common-sense precautions about keeping amphibians. This page will talk bout those precautions and how keepers can keep both their frog and themselves healthy and safe. Let me start by saying that our frogs are actually a lot more at risk from us than we are from them. Certainly more ADFs have been killed due to neglect or inadequate care by their owners than the other way around. As with any pet, but especially a pet that lives in a glass tank, we create and control their whole world. When something goes wrong, it's almost always our fault, and preventing things from going wrong is our responsibility. That being said, let's look at the one very real risk that African dwarf frogs and other amphibians (and reptiles, as well) present to their keepers: Salmonella. Many healthy frogs and other amphibians carry the bacteria that cause Salmonella, a disease that can be serious and sometimes fatal to humans (but doesn't affect the frogs). It's usually a disease of the digestive system that causes high fevers, cramps, and diarrhea, but which goes away in a few days to a week, with or without treatment. If Salmonella gets into the bloodstream and attacks other organs, however, it can be fatal. Young children, elderly people, and people with compromised immune systems are more likely to become seriously ill or even die from a Salmonella infection. Try not to touch your frogs. If you have to move them for some reason (for example, to a bigger tank), use an aquarium fish net. Wear surgical gloves when handling your frogs, their habitat, the water in their habitat, the filter media, or anything else that the frogs may have touched. Even if you wear gloves, wash your hands with soap and water before and after touching your frogs, their habitat, the water, the filter, or anything else that the frogs may have touched. You may also want to use an antimicrobial lotion or wipes after handling you frogs or their habitat. If you get your clothing wet with water from a frog tank, immediately put those clothes in the laundry, take a bath or shower, and put on clean clothes. Don't change the filter media near dishes or utensils used by people for cooking or eating. Keep young children away from frogs or their habitat unless you are directly supervising them. None of these rules are hard to understand. You basically want to avoid getting the bacteria on you or on any surfaces that people touch when working on your frog habitat, and wash afterwards just in case you did come in contact with the bacteria. If you follow those precautions all the time, you should never have to worry about Salmonella. Our frogs are much more at risk from us, their keepers, than we are from them. Here are some safety precaution to keep your frogs healthy and safe. African dwarf frogs are very delicate animals who can be easily insured. Avoid putting anything in their habitat that might cut or bruise them, such as gravel with sharp edges or broken pottery. Make sure your frogs' tank has a cover that will prevent them from jumping out. ADFs can only live 15 to 20 minutes out of water. Be careful not to create areas in which the frogs may get trapped and not be able to surface for air. If you use aquarium decorations, avoid decoration with spaces near their tops in which the frogs may get trapped. Their natural instinct is to swim upwards when they need air. If the top of the decoration doesn't have an opening, they may not be able to figure out how to get out of the decoration so they can surface to breathe. Make sure the water inlet opening for your filter aren't large enough for a frog's arms or legs to get caught in. For added safety, use an aquarium filter intake sponge. Don't place your frogs in the same habitat with aggressive fish, turtles, or other animals who may want to eat them. Be careful with electrical parts of the habitat. Don't run the wires in such a way that they may chafe against the tank and short out. There are some diseases that are harmless to humans and other warm-blooded animals that can be harmful to amphibians. To avoid making your frogs sick, was your hands with soap and water and wear surgical gloves before handling them or their habitat. Making sure that the water is clean and healthy. Maintaining the correct water temperature range (75 - 78 degrees Fahrenheit / 24 - 26 degrees Celsius) with a good aquarium heater. Creating regular period of night and day using aquarium lights. Proper and adequate (but not excessive) feeding. More ADFs are killed by overfeeding than underfeeding. If you properly tend to the basics of aquarium maintenance like vacuuming, checking the water quality, weekly water changes, aeration, and general cleanliness, your frogs will be less-likely to get sick. But illnesses do happen even if the best-kept aquariums. Here are some of the ones most common to African dwarf frogs. Please note that I am not a veterinarian and cannot give veterinary advice. This is just information that I've learned from my experience as a hobbyist. 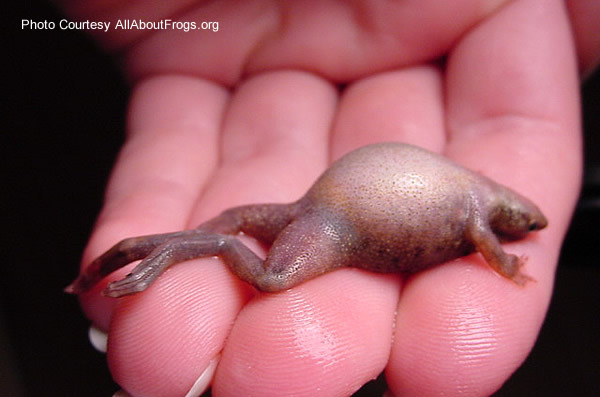 Dropsy is a usually-fatal condition in which fluid abnormally builds up inside the frog's body. It can also affect freshwater fish. It's not really a disease, but the result of one of several diseases. Some cases also have no identifiable cause. Whether or not dropsy is curable depends on what's causing it; but usually, by the time a frog starts to bloat, it is too late to save it. The most important thing at that point is to remove the frog from the tank and place it in a quarantine tank to reduce the chances of the disease spreading, just in case the cause is contagious. Then call a vet who treats reptiles and amphibians. Most of these veterinarians advertise themselves as "exotic animal" vets. Dropsy isn't always contagious because it can be caused by many things such as parasites, bacterial infections, kidney failure, or liver failure. Some of these conditions are contagious, and others aren't. Even though a vet may not be able to save your frog, he or she might be able to tell you what caused the dropsy, whether it is contagious, and whether you need to treat the other occupants of the tank. If you absolutely can't afford a vet and want to try to treat the frog yourself, you can try using Maracyn Two (minocycline) using the directions on the label for fish. If the cause happens to be one of the pathogens minocycline is effective against, maybe you and your frog will be lucky. But don't get your hopes up. If your frog is already bloated, it probably is too late to treat whatever is causing the bloating. Female frogs who are gravid (carrying eggs) may also look "bloated." You can tell the difference by looking closely at the frog. A gravid frog's belly (underneath her body) will be enlarged because she is carrying eggs in there, but a bloated frog's whole body will be swollen like a balloon. African dwarf frogs are susceptible to many fungal diseases. Most of them either appear as fuzzy or cottony patches or as sores on the frog's skin. This shouldn't be confused with shedding, which is normal for frogs. When frogs shed, however, the skin usually comes off in one piece, almost as if they were taking off a suit. If they are shedding in patches, then it's more likely a fungal infection. Methylene blue usually clears up fungal infections and is safe for amphibians. One particularly bad fungus that is threatening frogs throughout the world is called chytridiomycosis, or "chytrid" for short. Its symptoms include thrashing movements by the frogs as they frantically attempt to "climb out" of the water. The fungus usually invades their undersides, so they probably think the pain is being caused by something in the water. This disease is contagious. If one from has it, then all of the frogs in the tank need to be treated. Chytridiomycosis is treatable in the early stages with common, over-the-counter antifungal medications including benzalkonium chloride, itraconazole, and terbinafine hydrochloride, but none of them are marketed for use on amphibians nor available in pet shops for use in aquatic habitats. If your frogs come down with chytrid, you need to first isolate the frogs that are showing symptoms, and then call an exotic animal vet. Treatment of Chytridiomycosis really isn't very difficult in the early stages, but you'll need some help figuring out the medication dosages. Bacterial infections have as many possible symptoms as there are bacteria. Some of the more common symptoms include lethargy (you frogs may seem drowsy), red skin or eyes, cloudy eyes, or loss of appetite. Because these symptoms can also be caused by poor water condition or improper temperatures, you should check those things first before you assume that your frogs are sick. This is especially true if they're all showing symptoms. Bad water is more likely to cause all the frogs in a tank to look sick than a sudden outbreak of a bacterial infection is. If the temperature and water quality are okay, then isolate the frogs who appear to be sick and call an exotic animal vet. Most bacterial infections of frogs can be treated using antibiotics that are added to the tank water, but you need to know which ones will be effective against the particular bacteria and will be safe for frogs. Not all aquarium antibiotics are safe for amphibians.